Konnichiwa Parents and Caregivers! In the month of June, as part of Unit 5, we taught the children how we say some emotion words in Japanese. The children learnt how to say basic emotion words such as “URESHII(happy)”, ”KANASHII(sad)” and ”OKORU(angry)” and ”ONAKA SUITA(hungry)” in Japanese. To naturally memorise those words, we played some games such as the “Okami,(How are you wolf?) game”, “matching game/dice game”, “coin game” and “emotional face puzzle”. The children enjoyed those games while practicing emotional words in Japanese. They loved the “Okami game” especially when Okami (the wolf) was angry or hungry. They screamed and ran away from Okami with fear that Okami would eat them! It was fun! At beginning of every lesson, we always ask the children “Genki? (how are you? )” and the children normally say “Genki! (I’m fine!)”. But these days they often answer in greater detail with “Ureshii(happy)”, ”Kanashii(sad)” or ”Okoru(angry)”. For some reason, many of the children loved the sound of the word “Okoru (angry)”. Isn’t that interesting? The preschool children learnt some extra words such as “Nemui(sleepy)” and “Tsukareta(tired)” as well. We sang a song called “Te wo tatakimasho! (Let’s clap your hands) song”, and we also danced to this song too. The children loved dance to this song and we reviewed “Te”(hands) and “Ashi”(legs) from last month as well. In the song, we enjoyed clapping our hands and stomping our feet. The children also laughed and said “hahaha” when they were happy and they said “grunt grunt grunt” when they were angry. When they were sad, they cried and said “weep weep weep“”. All the children sang this song using their body gestures very well. We also sang “Katatsumuri(snail) song” and “ Gu choki pa” (rock, scissors and paper) song. We read a book called “Gokigen no warui kokku san (A chef who was feeling down)”. In the story, we tried very hard to make the chef happy. The children enjoyed this funny story especially when the chef disappeared! The story however, ended on a happy note with the children enjoying imaginary lollipops created by the chef. All the children liked singing songs and reading the stories. We are going to continue doing these activities by not only teaching the children Japanese, but also building on their interests in those activities. The toddler children enjoyed their Japanese lessons. They can now count from numbers 1 to 5 in Japanese with their hand gestures. They were so cute when they said “GO! (five)” while they put their arms up. They loved singing the “Otenki” (weather) song and Kirakira boshi (twinkle twilnkle little star!)”. Their little body actions were so adorable! In Japan, the rainy season lasts from beginning of June to mid of July. We call it the rainy season,”tsuyu”. This literally means ”plum rain”, because plums begin to ripen in the the humid season. Tsuyu season is also known for its beautiful hydrangeas called “Ajisai” which come in many colours, the most common being blue, white, pink and purple. Hydrangeas look even more magnificent with the addition of a few raindrops. Hydrangeas are seen in many places including temples and shrines. As we continued on our discussion of the rainy season, we spoke about appropriate rain wear such as rain boots, umbrellas, and rain coats. Talking about all these made us so happy! We also spoke about animals we see in the rain, like snails and fireflies. 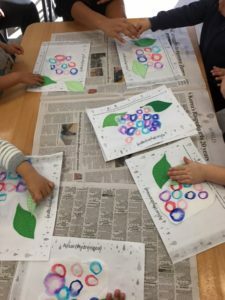 Enjoying the Japanese “Tsuyu” season, all the children made AJISAI (hydrangeas) art. 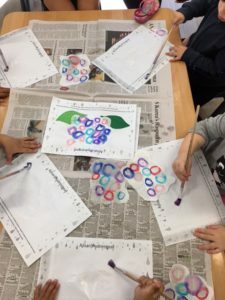 To create the art, the Junior and Senior Kindy children first drew colourful circles on the kitchen towels. 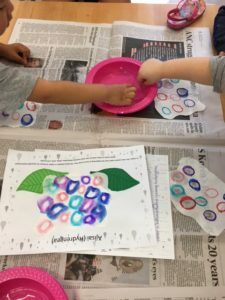 Then, they put their fingers in the water and dripped the water onto the kitchen paper. 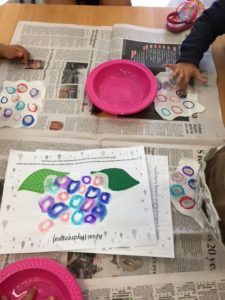 They were delighted to see the colour spreading with the dripped water on the circles. It looked so beautiful! Each piece of Ajisai art looked so unique depending on the colours that were used and how they mixed with the water. Please come in and have a look the pretty Ajisai arts on display in your child’s room. In the month of July we are teaching Unit 6, which is Shapes and Weather 2. We would really appreciate your involvement in Genki Japanese.